Cowslip is a perennial plant; the succulent, hollow,furrowed, glabrous stem grows 1 or 2 feet high and bears one or more kidney-shaped, dark green, shiny, crenate leaves. Bright yellow 5-9 sepals make up for the lack of petals in the flowers which grow in cymose clusters in April and May. 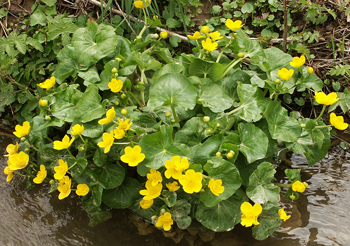 Found in marshes, wet ditches, along streambanks and pond edges in the northeastern United States and in Europe. Used like the pasqueflower, but weaker. Sometimes eaten in springtime as greens or pot-herbs. Root tea induces sweating, emetic, and expectorant. Leaf tea is diuretic, laxative. Ojibways mixed tea with maple sugar to make a cough syrup that was popular with colonists. The syrup of the leaves was used as a folk antidote to snake venom. Cowslip contains irritant acrid elements. Use only after cooking or drying. All parts may irritate and blister the skin or mucous membranes. Sniffing bruised stems induces sneezing. Intoxicaiton has resulted from the use of the raw leaves in salads or using the raw flower buds as substitutes for capers. Do no confuse with American White or False Hellebore (Veratrum viride), which is toxic. Use for medicinal purposes with medical supervision only.